Idaho Leads U.S. As Fastest Growing State, Census Bureau Reports : The Two-Way The population of Idaho increased by 2.2 percent, making it the fastest growing state in the U.S. Three other western states were just behind it: Nevada, Utah and Washington. 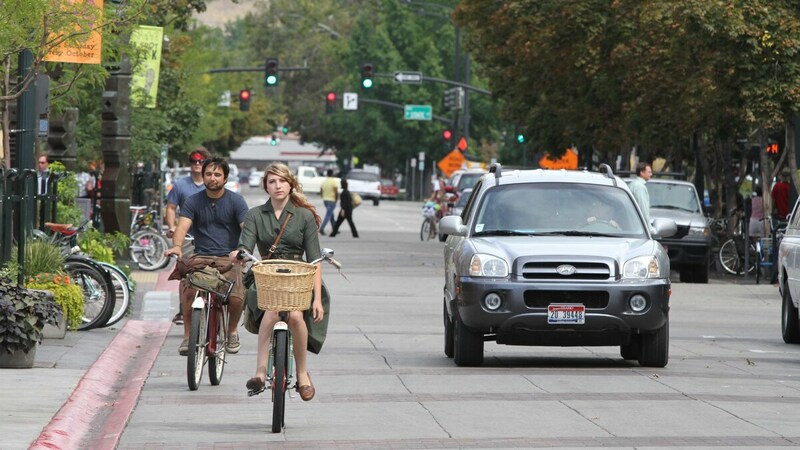 Bikers pedal through downtown Boise, Idaho, on Sept. 14, 2010. Following in the footsteps of the Oregon Trail fur traders, Americans are again flocking to the West in great numbers, according to new data from the U.S. Census Bureau. But of course, this time they aren't making the journey in covered wagons. Idaho saw its population jump by 2.2 percent from July 1, 2016 to July 1, 2017, leading the nation as the fastest growing state. Three other western states saw similar growth during that same period: Nevada, Utah and Washington. The overall U.S. population also grew by 2.3 million. This is the first time in at least a decade that Idaho has topped the list as the fastest growing state, says Molly Cromwell, a demographer with the Census Bureau. "Domestic migration is the primary factor driving that population growth. We're also seeing that in Nevada," she tells Here & Now's Jeremy Hobson. "But in Utah, which is the third fastest growing state this year, natural increase — or more births than deaths — is a driving factor." States in the South and West continued to lead in population growth, as more people move away from the Northeast and Midwest, Cromwell says. Thirty eight percent of the U.S. population now resides in the South, while 23.8 percent lives in the West. "Both the West and the South saw a 1 percent growth in 2017," she says. "But while the South had more than twice as much growth from migration than the West, it's because the population was almost twice as large." In Idaho, the economy is a major driver of population growth, which the state's department of labor estimates will continue to increase at an annual rate of 1.4 percent through 2025. The state's unemployment rate is below the national average at 2.9 percent. Idaho is also booming with out-of-state transplants who are arriving to work in the state's developing tech sector. Between 2014 and 2015, Idaho had the second-fastest growing tech industry behind Utah, according to a report by CompTIA, a non-profit trade organization for the information technology industry. Most of the tech industry is based in Idaho's capital of Boise. Long dismissed as flyover country, the lower cost of living in Boise has boosted the city's cultural cachet, drawing comparisons to Portland, Ore., and Austin, Texas. But that growth is pushing housing prices up, Harrison Berry of Boise Weekly told Hobson in August. "That's creating a real pinch for people who live and work near downtown," he says. "The people who sling your coffee are kind of being pushed to the outskirts, while some of those rentals and for-sale homes are being scooped up by people with more disposable income." Economic data provides a clue into the reason for domestic migration. Eight states lost population this year, with Illinois and West Virginia losing residents at the fastest rate, Cromwell says. In Illinois, residents are leaving due to the state's budget crisis. Moody's Investor's Service estimates the state owes more than $250 billion in public pension debt. In the U.S. territory of Puerto Rico, which is working to restructure its $120 billion debt, the population dropped from 3.4 million in 2016 to 3.3 million this year. However, those numbers are likely higher due to the mass exodus following Hurricane Maria. Cromwell also says that the nation's population growth rate is slowing down, in part due to an increase in the number of deaths. According to new data from the Centers for Disease Control and Prevention, the country's average life expectancy dropped in 2016 for the second year in a row. A leading reason for the decline is a 21 percent increase in drug overdose deaths, many of them related to the opioid crisis.